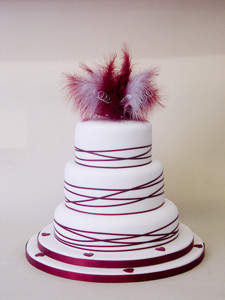 Your wedding cake is a great opportunity to make a statement about who you are as a couple. In the same way you design your bridal outfits and flowers and even your wedding vows to reflect your personal style and tastes, you should aim to do the same with your wedding cake. It is a crucial part of your wedding event and should have pride of place in your reception. Centuries ago your wedding cake would have been made of wheat which is a symbol of fertility and future wealth. As a fertility rite, the cake would have been thrown at the bride! Interesting! These days however your cake is less about fertility and more about a reflection of the themes of your wedding which in turn reflect both of your personalities. And we can do away with wheat. Contemporary wedding cake makers of course offer a wide range of decorations that can look amazing on the outside and ingredients that taste fantastic on the inside. So how do you go about creating this personalized piece of sheer indulgence? It is suggested that you decide on the theme of your bridal outfits and reception décor first, and then organise your cake to reflect this. Having decided how your cake fits into your own theme, will help to shape the discussion with your cake designer and make the whole process smoother and less pressure. Remember also the sooner you know your theme, the sooner you will have some ideas about your cake and the sooner you book your cake the greater the chance of you having exactly what you want. Plan early. The size of your cake will obviously be dependant on the number of people you are inviting to your big day and your budget. Again along with the theme, these details will help your cake designer to advise you of your options and help ensure you have the cake you would really like. On a low budget? Well there is room for improvisation. 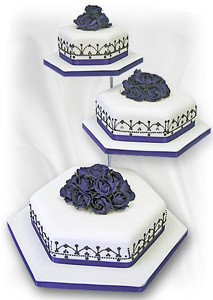 You can order a small cake and have sheet cakes which can be made of the same flavour to serve. The whole set of tiers do not have to be made of real cake. Your designer will show you how to cut costs. Do you want your cake to be the main dessert of the meal or do you want your guests to be able to take a slice home with them? So you know your themes and your budget, below are some things you may wish to discuss with your cake designer. There are m any different types of cake to choose from. Classic wedding cakes are traditionally made from rich fruit soaked in brandy for many weeks and covered with marzipan and sugar paste. Although many couples are choosing cakes other than traditional cakes, remember a tier of the cake can be kept to use for an anniversary or for the birth of your first child. Contemporary wedding cakes may be made of fresh Madeira cake or a moist succulent carrot cake with a cream cheese filling. These ingredients are light and easy on the stomach. Chocolate wedding cakes are the ultimate in indulgence, a tier of which could be combined with either tiers of the classic or modern style cake types. 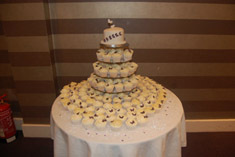 Finally you may wish to dispense with a single, tiered cake and provide imaginative, individual cup cakes. Bear in mind, a number of flavours in competition maybe distracting. Some flavours are overbearing like chocolate. Make sure you can taste subtle flavours like almonds. In many ways the sky is the limit but use your designer to help you to see what is possible. Whichever cake you finally decide on make sure your designer has offered you samples of the different cakes available and have lots of fun tasting them. You can’t obviously satisfy the tastes of all your guests so choose the one that makes your mouth water! Here’s a little something to ponder….. Marie Antoinette a famous French Queen was reputed to have flippantly said “Let them eat cake” when the peasants had no bread to eat. Well as the Queen at your feast here’s a variation – Let them eat my cake! As it’s your special day, your guests will no doubt happily join you in your indulgence. With the trend towards personalizing cakes, many couples are choosing to use a whole range of uniquely personal symbols on their cakes. Your hobbies and interests can be a source of imagination. Are you golf fanatics? Do you both share a passion for Star Trek? Did you meet at an unusual place and have a symbol for this? Obviously the colours and themes from your overall reception can also be used. A good designer will make every effort to realize your creativity. Check if using fresh flowers whether they have been sprayed with pesticides and which ingredients are likely to melt. Cake toppers are a way to accentuate your cake. Whether you use a figurine, traditional, sugar flowers or your own personal symbol, your cake topper can be used for dramatic effect – have fun with it. Designers can show you previous work to get some ideas. Many cake designers consider their cakes to be works of art. Indeed the time, effort and passion involved would make them worthy of that accolade. With this in mind your specially created work of art should have a special table in your reception. Your cake not only says something about the people who created it but more importantly about you. It will rank high as one of the things people will remember when they recall your wedding. Decorate the table with your theme. Colours flowers and symbols reflect this. Sumptuous fabrics create elegance. Round tables for round cakes, rectangular tables for rectangular cakes. Weddings are generally expensive with the average wedding costing in the region of £21,000. With the Royal wedding just around the corner, this could persuade wedding vendors to increase the price of their services as couples try to marry in the same year as William and Kate. Not everyone can afford to have a luxury wedding day, but with these top ten tips, you can have the wedding of your dreams on a budget. Set the date – Wedding venues will cost more to hire on a Saturday as for obvious reasons, this is the preferred day for weddings. Even though people may have to book time off work, having your wedding on a weekday could save you thousands of pounds. Cut the guest list – This is where you have to be brutal. The more people on your day/evening guest list, the more expense you will be shelling out. Think about a cut-off point for guests and think about whether you really need to invite your great auntie’s cousin. Wedding Cancelation Insurance – In the event of a disaster, it is always worth covering your big day with wedding insurance. This will protect your finances in the event that you need to cancel your wedding and re-arrange for another day. DIY Invitations – It is possible with a little inspiration to create a number of wedding items yourself. Items such as invitations, place cards, seating planner, letterbox for cards are all easily assembled at a fraction of the cost. “eBay it” – The popular online auction eBay is packed full of wedding suppliers. Most of them selling items brand new at very competitive prices. Friends & Family – Your parents and your best friends will no doubt be playing a major role in your wedding day. So ask them to help out with planning and preparations. Food & Drink – Speak with your caterers openly and honestly about what you want. Tell them you are looking for as low a price as possible. So if a traditional Sunday lunch is not on the menu, ask, it may be cheaper. An online wedding dress – Possibly the most important part of the wedding and the most difficult to get right. After finding the right dress, have a look online to see if you can get it cheaper. Honeymoon at home – Although we often dream of spending two weeks in the Bahamas or Mauritius, sometimes our budgets won’t stretch this far. So what could be more romantic than a honeymoon in a log cabin here on British soil. The wedding venue – As long as you are getting married to the person you love, then the venue really is not that important. If you are really stretched for money then consider a registry office or even Gretna Green. The wedding cake is one of the most important details in any wedding. 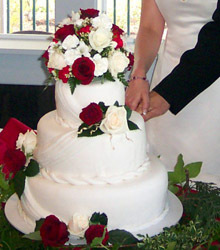 The cutting of the cake is one of the first tasks the couple will complete together as husband and wife, so the cake has to look and taste good. It’s going to be one of the most photographed moments of the wedding and one of the many things your guests will remember from your wedding. Firstly decide on how many people does it need to feed? From this point you can decide on flavour and style. It’s best to discuss flavour options with your partner – after all its your wedding so choose flavours you will both enjoy and if you’re opting for a tiered cake then why not opt for different flavoured tiers. If you decide you want a cake covered in chocolate take into consideration what the weather will be like, if its summer there is the chance that the cake will start to melt, the same applies with using fresh fruit,cream, or buttercream if you want the cake to be a focus of your wedding be careful when choosing one of the above as they can’t sit out in the open for more than a few hours which means that the look and taste can be ruined. In terms of icing, the best option to use is a rolled out icing (fondant) this can be coloured in virtually any colour, it can sit out in the open to be admired by your guests and the design possibilities are endless. Once you’ve decided on t he flavours think about what style you would like, do you want a tiered wedding cake? how many tiers? do you want them stacked on top of each other or separated? Consider how many people it needs to feed if you’re having a small wedding and only need to feed under a 100 people but you want a 5 tier wedding cake ask your cake maker if they can insert dummy tiers into your cake (these are just polystyrene boards decorated the exact same way as your cake, and it can lower the costs but do take into consideration although it is not cake it does still take the cake maker the same amount of time to decorate it) and as long as no one tries to eat these no one will ever know its fake! Or would you prefer cupcakes? these can be individually crafted and styled to your theme, there’s no need to have to cut them up to worry about portion size and guests can take them home instead of eating it straight away or you can get them boxed up and double them up as favours or place names, and don’t worry cupcakes can certainly have the same wow factor as a 5 tier cake. Depending on your budget and you chosen cake maker you can have several different styles, flavours and even have them personalised to each guest. Once you’ve decided the fundamentals above you can get to the exciting bit of designing, choose a colour palette to complement your theme or wedding dress. For fun and funky cakes choose bold contrasting colours, for something more chic and sophisticated use colours from the same colour palette so they complement each other. Vintage and lace will be one of the biggest trends this wedding season think big brooches, ribbons and lace detail. monochrome and different size tiers will also be another big trend. Many wedding cakes are decorated with fresh flowers and can look absolutely stunning, if you’re using fresh flowers to decorate the venue you can use some to decorate the cake this will tie in all the details together or just use them to dress the table. Again with flowers take into consideration the season you’re getting married in your favourite flowers may not be in season, some flowers wilt as soon as there taken out of water. 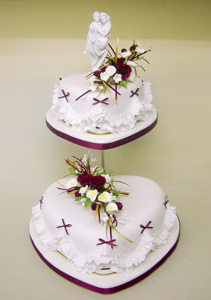 Dont worry your cake maker or florist can advise you on what flowers are in season and what would work well. It’s your wedding, your PERFECT wedding cake is what you want, what you’ve always dreamed of so make sure your designs and opinions are put across to your cake maker, show your cake maker your wedding outfit, where you’re getting married, your colour palette. there are a number of things to think about when choosing your wedding cake utilise your cake maker they can help you make most of these decisions they will tell you what works well, the best way to set up and display your cake.